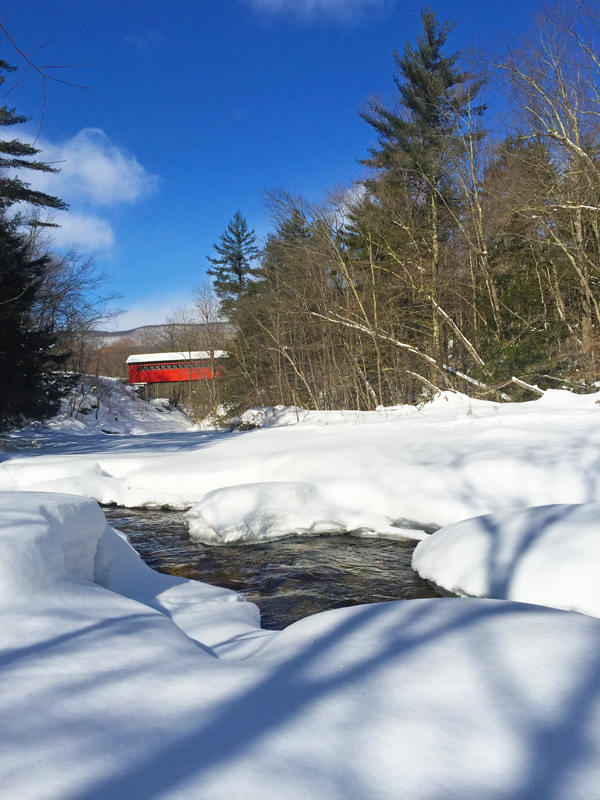 The Chiselville Bridge spans the Roaring Branch Brook. But actually, it’s located in Sunderland. Here in Vermont we expect and embrace a little ambiguity. When exactly does winter end and spring begin? Like most paintings this one has an interesting lineage. See below. Also, please enjoy the new video below! Very often it comes from you. Q. How many people did it take to create “Chiselville Bridge”? 1. Dee is a faithful Day in Vermont subscriber. 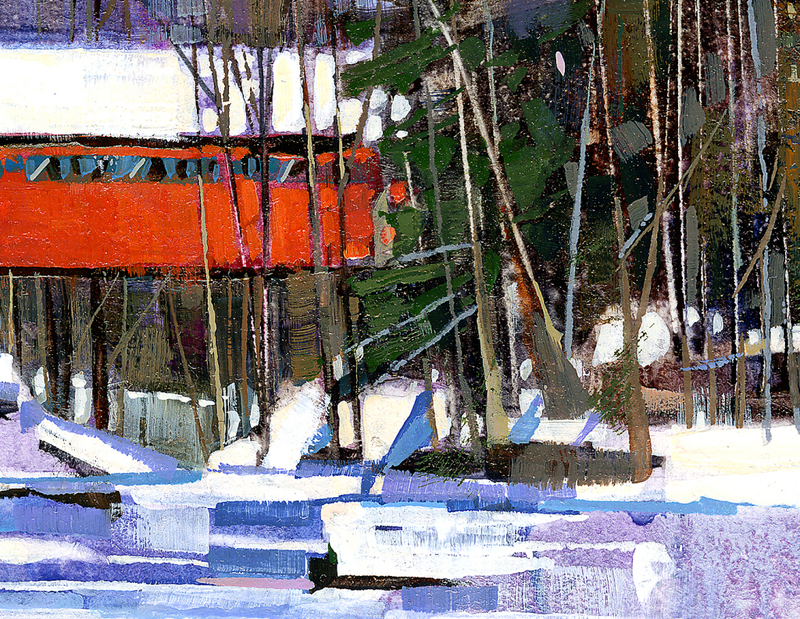 She sent me a nice note suggesting I paint the Chiselville Bridge. I appreciate your suggestions and keep a very long list of requests. Occasionally, one gets done. 2 and 3. I stopped for gas and directions to the bridge at the local Stewart’s in Arlington. Two local men I encountered were more than happy to give me directions and a brief history of the bridge. One stocked shelves while the other fixed his coffee. Those nice gentlemen may never know their important role in this story now being shared with four thousand subscribers and many more Facebook friends. 4. Arriving at the bridge I realized I couldn’t get down to the river on either side to get the side view I really wanted. The snow was two feet deep. As if Heaven was conspiring too, just then I met a new friend Avis as she walked her dogs across the bridge. We had a nice chat and she suggested that I drive down Roaring Branch to see her friend Kiki. Perhaps I could get access to the river from there. 5. Unfortunately she wasn’t home, but Kiki has since invited me back via email. Perhaps there are future paintings in the neighborhood! 6. Luckily Avis had a back-up plan. You see, her friend Wilson was visiting from NJ the week before and he had shot a number of great photos with his phone while snow-shoeing on the river. In fact from the very spot I wanted but couldn’t get to. 7. Wilson and I connected via email. After working through some technical issues together, he sent his wonderful photos along with permission to use them however I wished. 8 and 9. In the mood for another video, my friend Daniel Appelt shot it in my studio, and with the help of his wife Anne, edited and produced the final piece for your enjoyment. 10. As for me, all I had to do was connect the dots. You can bet that any good painting has an authentic experience behind it. The way I see it, my job as an artist is to recognize, appreciate, and share the beauty that surrounds us. Of course, there’s always plenty of that to be found here in Vermont. And for those who are looking, there’s plenty of that to be found in each other too. “Go looking for inspiration. Find subjects that speak so strongly to you that you can’t wait to paint them. Immerse yourself in the energy of the locations, and then it won’t matter how you bring it home alive – sketches, studies, or photos – just as long as your passion is stirred. Put that into your paintings and just see what happens.” Mike Svob. I live near the bridge and cross it daily. When the weather is better, there is an easy path to get down to the river and view it. Like most of us by now, I sure have a lot of things planned for when the “weather gets better.” 🙂 Thanks Jerilyn! Thanks very much Susan. I typically like to invite the muse to come out and play in the early stages of a painting. I think the Universe appreciates an open mind and rewards a little audacity with happy accidents. Imbuing passion and enthusiasm into your painting early on pretty much ensures they will hang around until the end of the party. I enjoy your work and wish I had your talent. Someday I’d like to be able to paint watercolor miniatures like Prince Charles. Thanks Bob, I don’t know much about PC, but I’m always wary of the word talent. I’ll have to write a post about that soon. That is quite a story!! Those are just the people we encounter here when we need help. Hopefully we will not get mired in the Mud and need a tractor down the road and hopefully you won’t either when you are out on a search for a new idea. This is a beautiful painting! Everyone in should something of yours. I have been inspired and am getting my brushes and paints out now. Thanks again for making Monday great! My pleasure Muriel. It’s easy to forget that every day is an opportunity to make new discoveries, especially in finding good in each other. I always look forward to “A Day In Vermont” emails letting me know that you have a new painting with a short story about your subject. I absolutely love when you include a video. I appreciate all that you do. My passion for “A Day In Vermont” reminds me that it’s really the small things in our life that sometimes mean the most. Many thanks Randy! I’m so glad you like the videos. Sure they cost a little extra effort and money, but anything worthwhile usually does. If they can help make one person smile, well worth it! Great video, great painting! Your voice is so present in your written words, and your paintings sing with color and energy. Awesome, Peter! 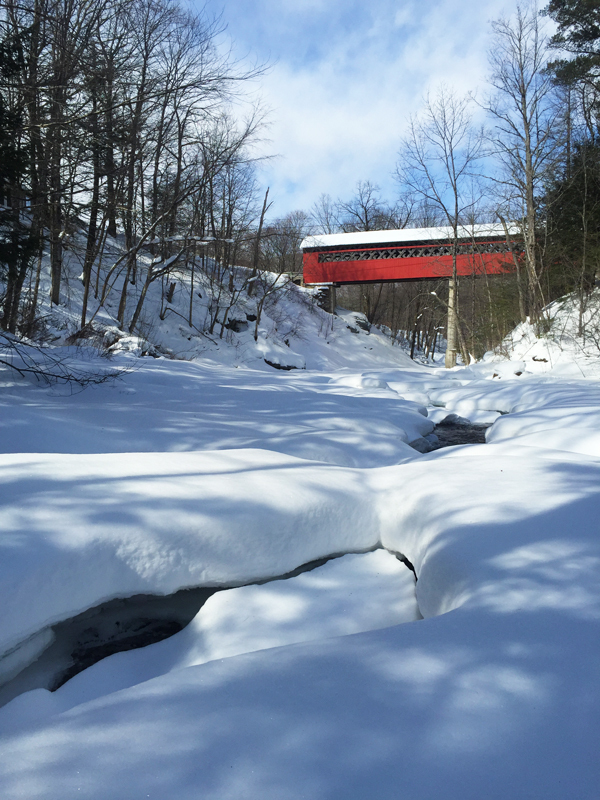 I love getting your Days in Vermont — truly inspirational. Thanks very much Kathryn, as a fellow artist I know you have experienced moments when all the “pieces” seem to fit together. Precious moments indeed, and often fleeting. 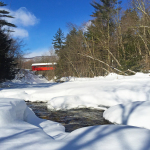 I do feel with A Day in Vermont that I am finally doing what I was put here to do…and sharing it all with others is definitely the cherry on top. Best of luck with your show at the Edgewater Gallery in Middlebury, I can’t wait to see it! I always look forward to your paintings. 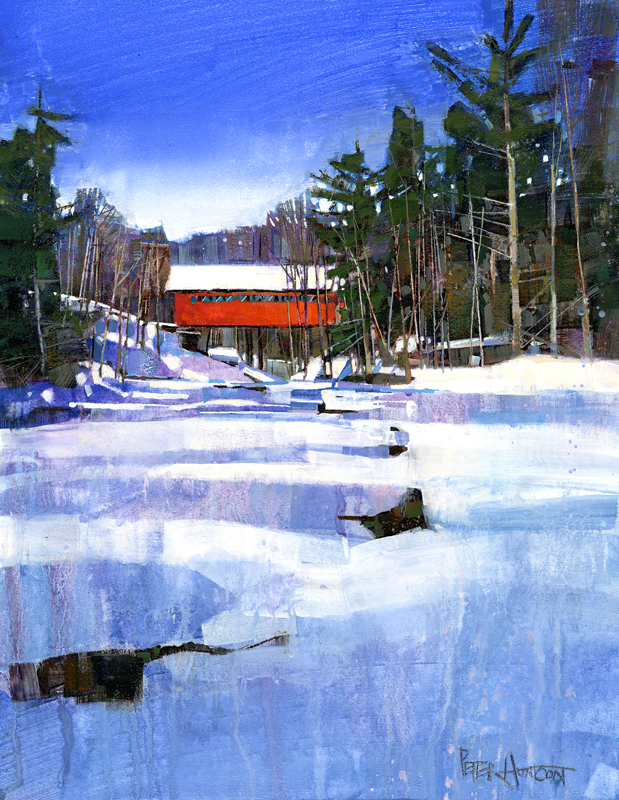 I am very familiar with the current covered bridge and have several paintings or prints of covered bridges. If I were fortunate to be a winner, I would have a very difficult time picking one of your paintings – I love them all! You are very kind Phyliss, good luck to you!! I lived in West Arlington for ten years and crossed that bridge many times on my way to take my trash to the dump. Your painting is beautiful and I miss it all back there ( California now ). Did you paint anything in West Arlington? P.S. My Uncle was Gene Pelham from West Arlington. Hi Tom, nothing from West Arlington yet, but if you have a suggestion I’m always happy to add it to my list. Warm regards from home, and Thanks! Peter, these weekly paintings are such an inspiration – each and every week – but the way you WORK at it, your technique, your imagination, your “eye”….leaves me breathless…I aspire! (Although it’s tough, for I’m not sure which end of the brush to hold!!!!!) You make Vermonter’s PROUD! “Tis a GIFT to capture this kind of beauty! Aw shucks Victoria, you make me blush. (no lie) Thanks you!! Spectacular, Peter. it’s on my FB….. you are becoming a master !! Thanks so much for the big support Bianca! FINALLY, one of my suggestions! I will have to do a Battenkill fishing piece this spring David, thanks for the great suggestions! Spectacular! 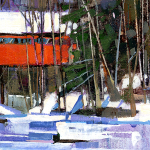 This one is so vivid and full of the winter Vermont spirit! I really look forward to opening my email and seeing each new painting. Thank you for sharing with us your artistic journey and wisdom! 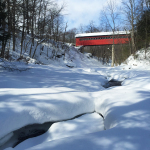 I especially like the impression you created of massive ice formations in the river… So much more interesting than the rounded snow mounds over rock shown in the photos, and the more “blocky” shapes of the ice echo the lines of the bridge and tie the whole scene together so nicely. Thank you much Brian. Only a fellow artist talks like this. “Echo” is a GREAT word and important compositional concept. I like “Integration” just as much. Thank you Anita, and hopefully all that ice melts a a nice, gentle pace. And thanks so much for bidding!